Accurately displays both humidity and temperature at the same time. Memorizes and stores both the highest and lowest temperatures and humidity. 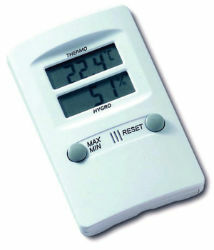 Two-button operation, minimum and maximum temperature and humidity, and reset button. Desktop or wall-mount use. Temperature range of 14°F to 140°F. Humidity range of 10% to 99%. AAA battery included.